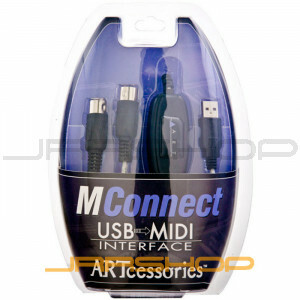 The ART MConnect USB MIDI Cable provides an easy way to directly connect any MIDI device, including musical instruments, controllers and sound modules, to your computer's USB port for convenient use with audio workstation software for music production, recording or sequencing without any extra equipment. The MConnect supports up to sixteen channels in and out. Indicators simplify troubleshooting incoming and outgoing MIDI data. No special drivers are required, just "plug and play" with your Windows PC or Mac. Simply plug the MIDI In or Out connector (whichever is appropriate) into your device and the USB connector into your computer. That's all there is to it. The first time you connect your MConnect to your computer, all the necessary drivers will be automatically installed and the cable will then be ready to use. The MConnect may be used with any software that supports USB MIDI devices.